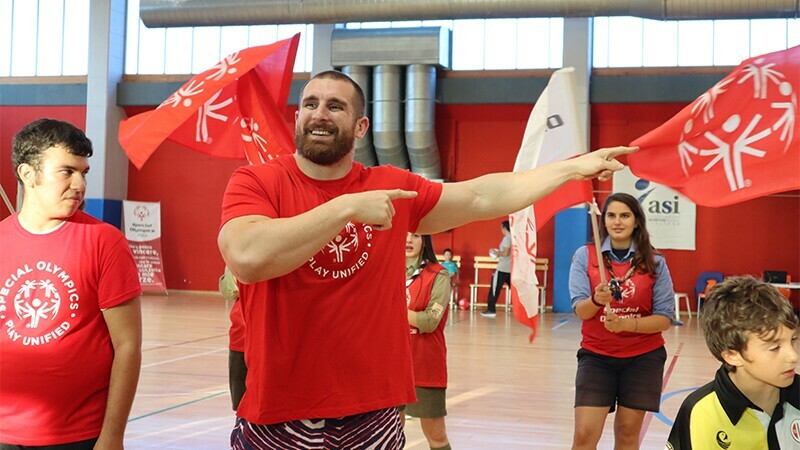 “Because when WWE and Special Olympics get together, WE GET HYPED!” and with those words from Mojo Rawley, the last stop on our Special Olympics European Tour began in a packed gymnasium in Rome, Italy. While in Manchester, our athletes spoke to middle school youth about the power of inclusion. 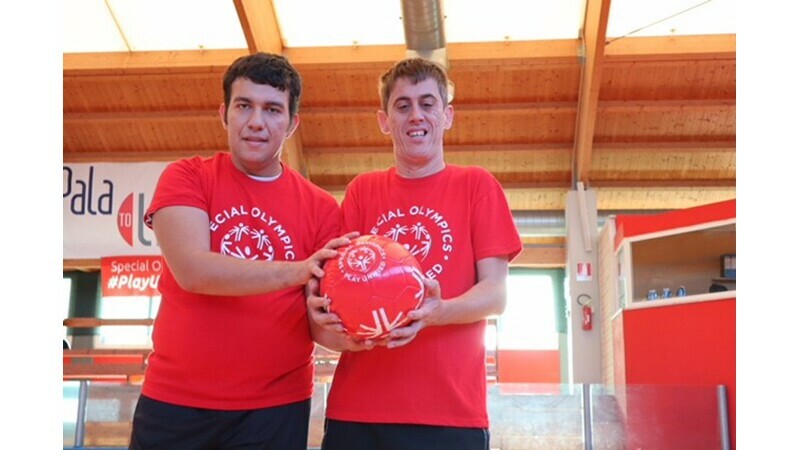 In Cologne, athletes participated in a unified workout, but it was in Rome where we saw the ability of Special Olympics athletes come full circle when Italia athletes invited WWE to join their universe – their own unified teams. 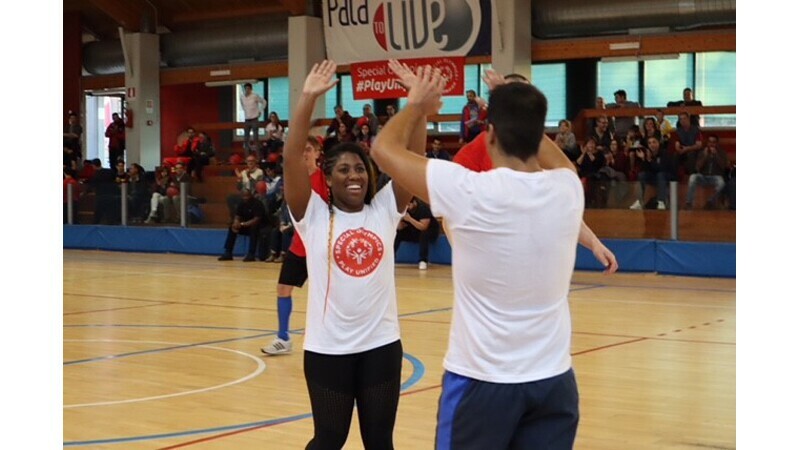 On Saturday, 10 November, WWE Superstars Mojo Rawley and Ember Moon accepted Special Olympics Italia’s invitation to join them on the pitch for a 6-v-6 match ahead of WWE’s Rome event later that evening. After splitting into two teams, Team Red (Mojo) and Team White (Ember), athletes walked out to the pitch hand-in-hand with local youth football players and match officials. They were greeted with cheers, Special Olympics flags waving, and balloons flying high in the stands. Although Team White took an early lead, Team Red did not make it easy with fantastic saves by the keeper and breakaway play with Mojo at the helm. To start the second half, Team White was up 3-1 and eventually took the match, winning 5-1. Ember Moon even put her years of playing soccer to good use, scoring a goal in the second half for her squad. Throughout the week, WWE and WWE Superstars have used their brand as a platform to elevate our movement to demonstrate to their audience a clear commitment to creating an inclusive world. 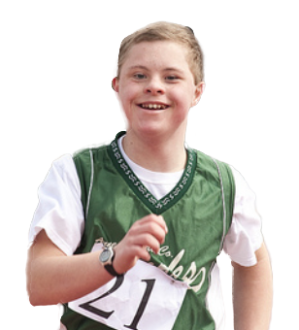 As we continue to build momentum towards the 2019 Special Olympics World Games, the WWE Universe is behind us! Mojo Rawley getting the crowd hyped.